I mean, who doesn’t love sprinkles? If it is you then I demand an explanation as to why you are dead inside. 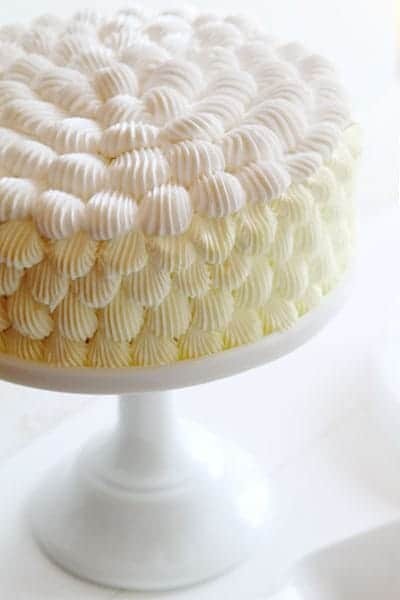 For the outside of the cake I called upon a technique I used before on a Candy Corn Cake. The difference being that I used a much larger tip (I believe it is the Ateco #195 tip) and only two colors, light yellow and white. 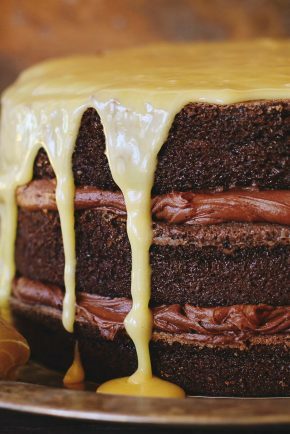 The outside is every bit as fun as the inside… because a cake should be glorious inside and out, right? 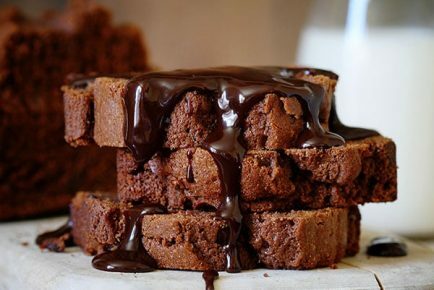 Make sure all “wet” ingredients are at room temperature. It is important in this recipe to not over mix the dry and wet ingredients or else the sprinkles may break and bleed. If the butter is soft (room temperature) it will be much easier to combine. I did NOT use the traditional rainbow sprinkles. You know, the ones that look like little perfect round circles? I found that they bleed considerably more when baked and tend to blend together. The rainbow jimmies work better. You can see them here. If you want to give this for a gift (I would LOVE this as a gift!) simply print out the ‘wet’ ingredients and the directions and attach to the jar. Recently at a food truck, I had the most amazing funfetti cupcake ever! I am glad I found this funfetti cake mix! Might give it at try! Thanks! I know the recipe said store in “air tight container” however would ziplock bags work just as well? Sure! That would work perfectly. 🙂 And thank you! 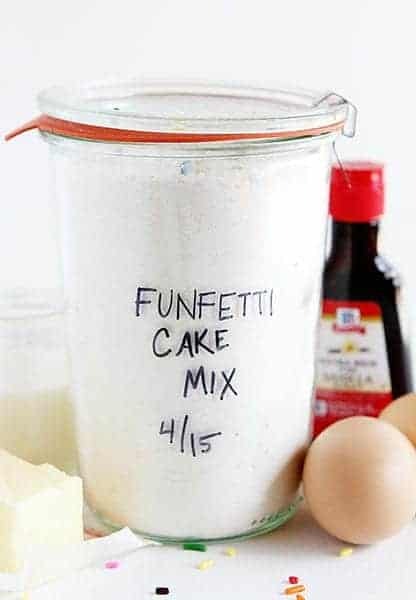 Love that you shared a funfetti version of this homemade cake mix! I know have an arsenal of mixes up my sleeve! With this being my (and everyone else’s) favorite boxed cake mix ever, you may have just put pillsbury out of business. 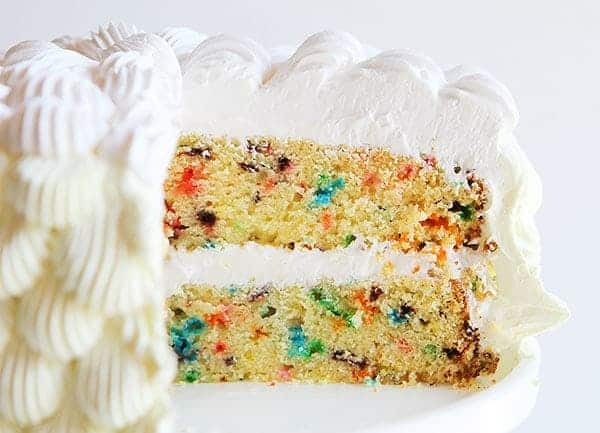 Gotta love funfetti – it always looks so festive and makes me smile. 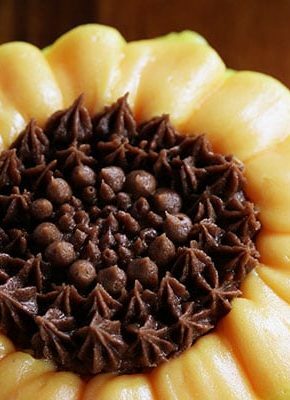 Thanks for sharing this recipe – cake looks not only beautiful but so moist and tender. 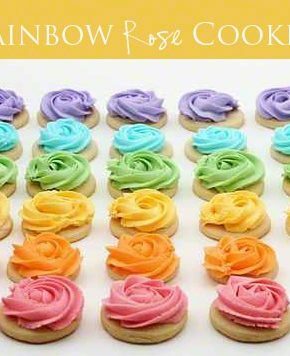 I love that you have all these cake mix recipes! Such a great idea. 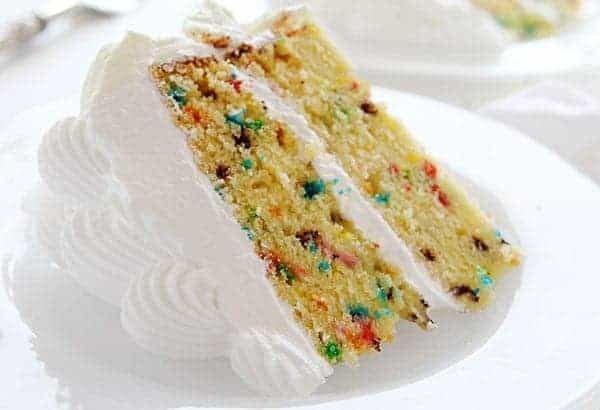 Confession: I didn’t even know funfetti cake existed until I was a senior in high school. One of my best guy friends asked if I’d bake him a funfetti cake if he did his math homework every night (who isn’t dessert motivated?? ), and I agreed… After I went home and Google what “funfetti” was. Oops! 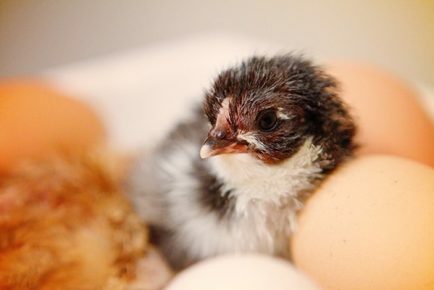 But yes, sprinkles definitely make everything cuter! This is absolutely genius! I made your homemade brownie mix and it was spot on, so I can’t wit to try your homemade funfetti cake mix, looks and sounds amazing! The cake mix aisle is going to miss me now that I have this! (What is it about kids and Funfetti?) Meantime, your pictures are SO beautiful! Love. Would sprinkles work just the same? or are jimmies the better option? it didnt turned out good for me. 🙁 the cake didnt rise. what might be wrong? the baking powder is newly opened. 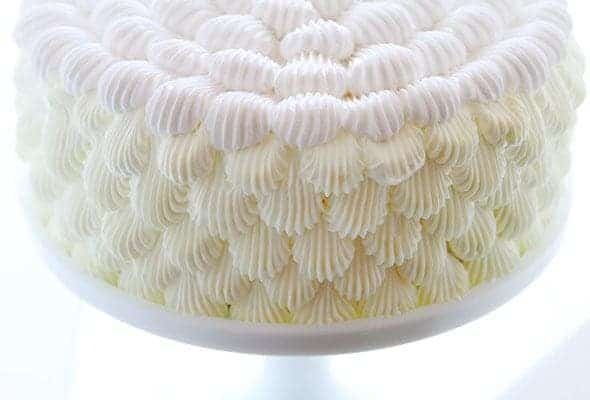 This cake is tasty and I look forward to making another one un-iced. The one switch I would make so my cake looks more like your beautiful photos is to use half the amount of sprinkles. The cake is almost tie-dyed, and it doesn’t seem to be a bleeding issue. Either way, my favorite four year old will love the colors. Quick question?! 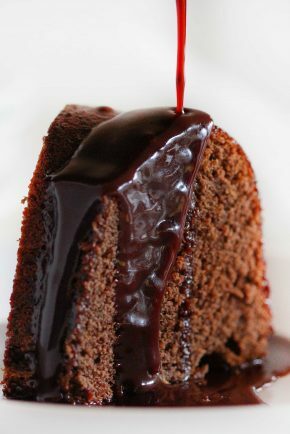 Could I use cake flour instead of all purpose flour?? I have not tested the recipe with that alteration so cannot speak to it’s effectiveness. Sorry! I tried it and it tastes delicious, but im not sure on the texture, but it was definitely a success. I hope you can see this in time for me to bake. I’d love to use this recipe for 2 giant donut cake pans – they each measure 8 inches in diameter. Would your recipe be enough for both pans or should I double it? Hi! I was wondering if it would be okay to eat if I didn’t bake it? 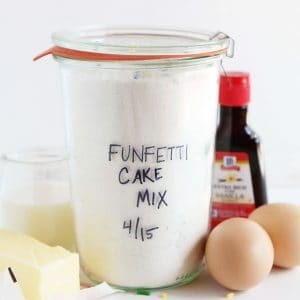 I wanted to find a way to make funfetti mix in order to made dunkaroo dip (convoluted, i know). Would it work at all? Hello, I am Laura from Texas. Is there any possibility of receiving recipes via Email? This method is what works best for me. Is this something that can be done?